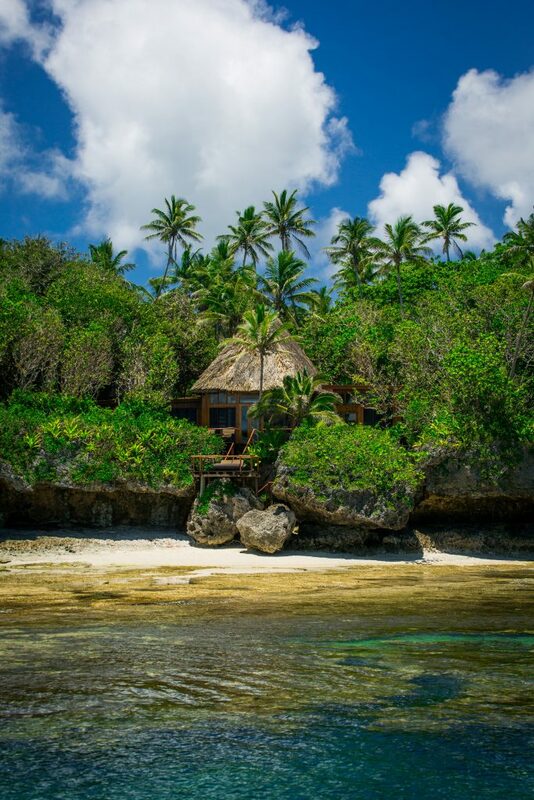 Of all the destinations for an island adventure, Fiji is among the best. Picture pristine rainforest, picturesque coastlines, vibrantly colored coral undersea, and gushing hidden waterfalls – Fiji has it all, and then some! Discover all the ways you can explore your adventurous side with this 7 or 10-day sample itinerary*. Your next island adventure awaits! Just because you’re seeking out the most thrilling and off-the-beaten-path experiences in Fiji doesn’t mean you have to rough it. Combine exciting activities with all the creature comforts and style of home by staying in a luxurious private villa – with traditional Fijian architecture like thatched roofs and organic island-inspired design, you’ll indulge in luxury amenities like plunge pools and jacuzzi tubs while still feeling connected to the destination. Find yourself nestled deep within Namale’s tropical gardens – a former coconut plantation turned luxury resort – and spend your first day in paradise taking in the gorgeous coastlines, walking along the tide pools, or swinging in a hammock on the beach beneath gently swaying palm trees – the perfect relaxing start to gear up for the coming days of adventure. Traveling to a remote tropical island requires plenty of time in the sand, sun, and sea! Fiji is the ideal locale for a snorkeling or scuba diving adventure, so take full advantage of daily excursions to various spots to jump in. Known as the Soft Coral Capital of the World, Fiji’s seas are bursting with world-renowned dive sites, coral reef systems teeming with life, and plenty of opportunities for marine life sightings, from sea turtles and octopus to myriad tropical fish and dolphins. The island of Vanua Levu, the second largest in Fiji and located in the northern islands, is home to a unique natural phenomenon – the Salt River and Salt Lake. Fed by the ocean, the river changes direction with the tides, meandering through lush rainforest and mangroves and ending in a large, undeveloped saltwater lake. Explore this truly unique and pristine natural landscape on the Salt River Drift – a fun and relaxing day trip that has you donning a lifejacket, jumping in the warm waters, and floating lazy-river style downstream. Take in extraordinary views while simply floating along, and convene at the end of the journey on a raft in the middle of the serene salt lake to share a cold beverage with your group. The remote region and its untouched island landscape are truly a marvel, and this activity is one for the books! Fiji’s island landscape offers plenty of options for hiking enthusiasts – whether you enjoy exploring the depths of the lush rainforest or trekking up the mountainsides to take in the best views. But what’s more, the island conceals many rushing waterfalls just waiting to be discovered. 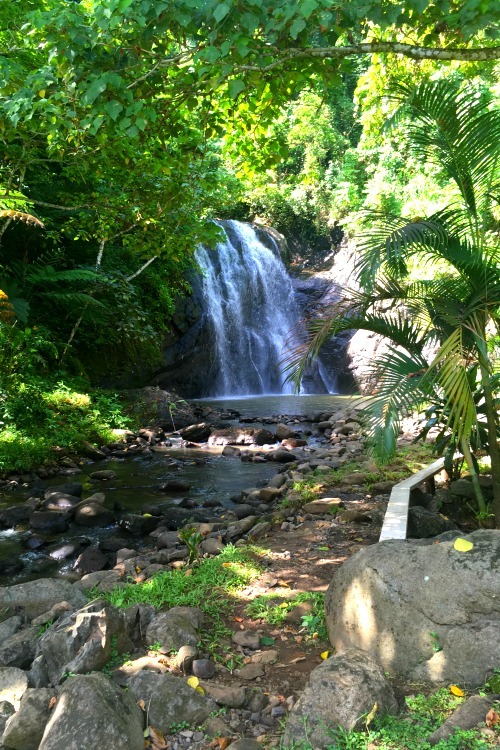 Spend a day exploring the trails, lined with thick foliage, papaya and banana trees, ferns, and orchids, and reward your efforts with a cool dip in a freshwater waterfall. Many waterfalls and the surrounding land in Fiji are owned by the local villages, so before you venture on your hike, get a taste of local culture by witnessing your guide present kava root and ask permission to enter from the village chief – a great cultural experience to add to your active island adventure! Did you know Savusavu is home to the world’s rarest saltwater pearls? Take the opportunity to visit J. 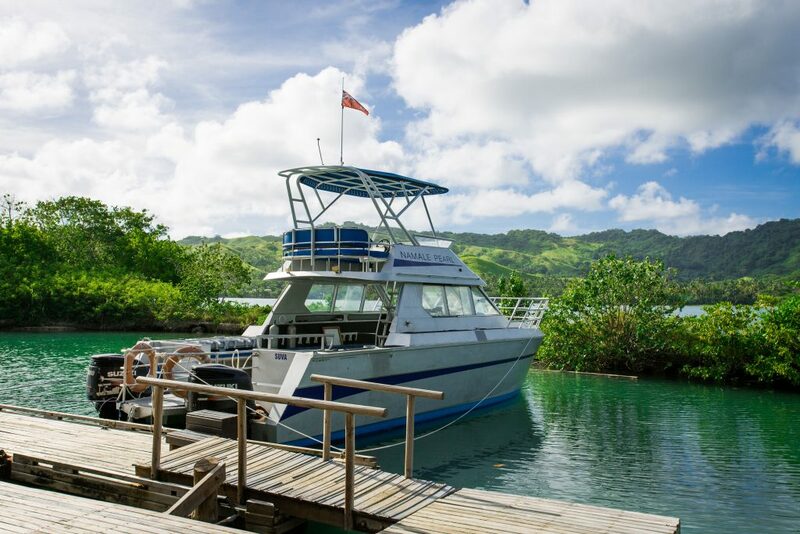 Hunter Pearl Farm, where you can take a guided tour to learn about how the family-owned operation cultivates and harvests saltwater pearls right in Savusavu Bay. 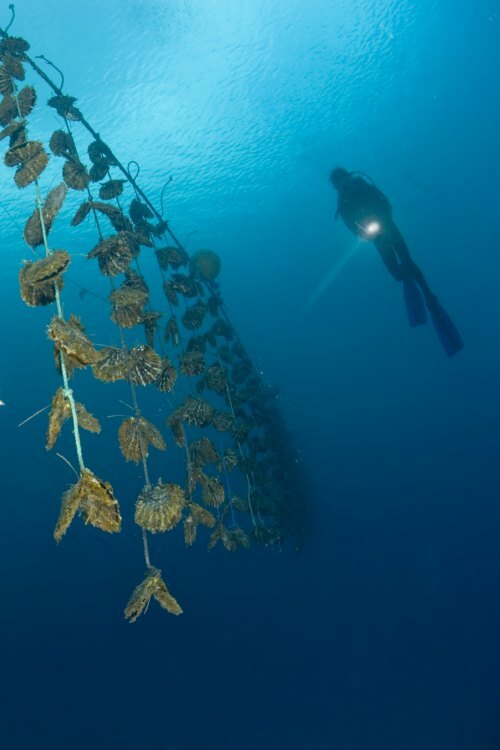 You may even get the chance to snorkel above the underwater pearl farm, which looks simply like buoys on the surface, but is actually made up of special large oysters carefully suspended on anchored ropes. Because of the mineral qualities and unique properties of the sea in the bay, Fiji pearls are known for their unique hues of ivory, pistachio, copper, chocolate, and peacock. A pearl farm tour is not only a once-in-a-lifetime experience, but also a great, meaningful souvenir to remember your journey by. Discover Fiji’s abundant nature even further with a Wild Dolphin Tour, which offers the opportunity to see native spinner dolphins in their natural habitat. You’ll venture by boat to Natewa Bay, which is a favorite spot for pods of playful dolphins, who love to swim and jump in the wake of boats. 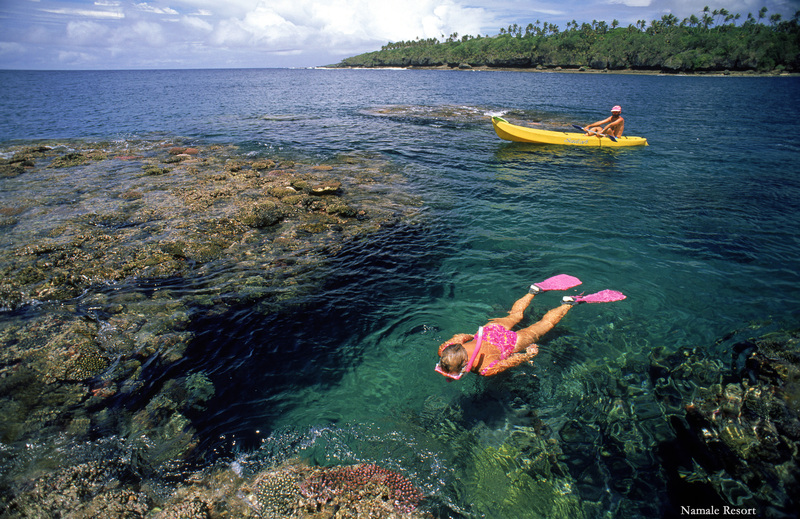 You’ll also have the chance to snorkel the nearby reefs for a full day of boating adventures. Make sure to bring your camera! This day you’ll venture 20 minutes by boat to a completely remote, deserted sandbar, where you’ll be castaway – but with plenty of champagne! On this Sandbar Snorkel + Picnic excursion, the soft white sand is surrounded by incredible coral reef, so you can choose how much time you’d like to spend lounging under a beach umbrella with a cocktail or in the water exploring the sea. Experience stunning views of the surrounding islands, with their green rolling hills and wild rocky shores. Even learn to crack a coconut by hand in true castaway style while you indulge in a gourmet picnic and another crisp Fiji Gold. If you still haven’t had enough island adventure, spend the day off the shore trying your hand at water sports! Take a turn waterskiing, wake boarding, or kneeboarding for an active challenge and thrilling rush. The water is warm, the sun is shining, and the boat is revved up – so jump in! And better yet, unlike other resorts, motorized watersports are part of Namale’s complimentary activities. For a mellower bit of fun, swim or paddle board out to the yellow water trampoline just off shore and have a laugh as you jump into the ocean! 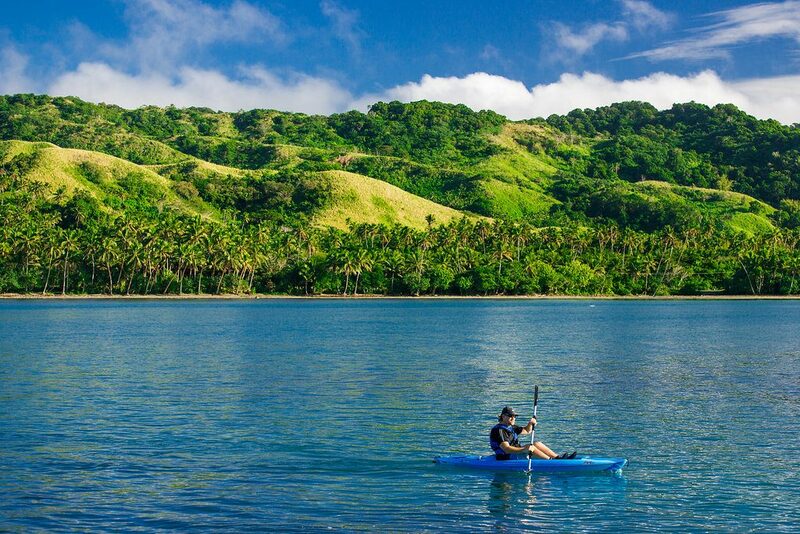 Walking along the coast and tide pools is a great way to explore the island’s volcanic shores, but for another point of view try sea kayaking or stand up paddle boarding (SUP) around Namale’s marina and just off shore. You’ll see how Namale’s bures and villas are nestled among the lush grounds, how the volcanic cliffs create the wild shorelines, and how the grand blue ocean seems to go on forever. Across the way you’ll see fires from the neighboring village rising into the sky, and maybe even some locals fishing along the shore. By now you’ve had an activity-filled island adventure, so take a Sunset Cocktail Cruise to unwind after all the action and spend some final time on the boat and water. Departing just before sunset, enjoy live acoustic music, hors d’oeuvres, and cocktails as you sail into the horizon. You’ve earned the bit of romantic downtime, so let the breeze flow by and prepared to be in awe of Fiji’s signature sunsets, that set the sky ablaze with color above a vault of azure blue water. Now that you’ve explored so many options, what does your ideal island adventure look like? Namale specializes in crafting unique itineraries based on your needs and desires, so let us connect you with our concierge to start planning today! *This is a sample itinerary and does not necessarily reflect a guaranteed schedule. All activities and excursions are weather dependent, based on availability, and subject to additional fees.